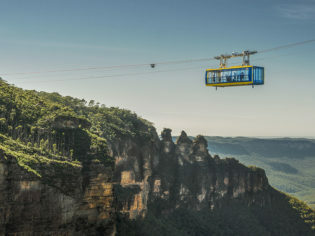 As a Scenic World devotee – who could pass up a ride on the world’s steepest cable-driven railway? – I cheerfully seized the chance to spend an afternoon meeting some new dinosaur friends in the misty landscape of the Blue Mountains. Could Dinosaur Valley be New South Wales’ answer to Jurassic Park? Scenic World’s Dinosaur Valley event is running until January 28, 2019. This means little ones and grown-ups can take advantage of the school holiday period to bask in the beauty of World Heritage-listed rainforest alongside some quirky characters from the Jurassic era. After checking into the Fairmont Resort & Spa (a much-loved playground for couples and families), we make our way to Scenic World and climb aboard the railway. The Scenic World rangers aren’t joking when they say it’s steep – I keep a tight hold on my backpack and savour the excitement that hangs in the air as we descend into Dinosaur Valley. The Jurassic Park theme song plays, which delights Marcus, my husband. I resist the urge to make dinosaur noises to go with the tune. It’s raining softly as we stroll along the trail and encounter our first prehistoric creatures. Squeals of joy ring from further up the path when a small girl spots dinosaur eggs “hatching” alongside clever dino vet props. The animatronic beasts we spy in the bushes are somehow more adorable than scary, despite being as realistic as they can be. Judging from the smiles on everyone’s faces, this would be a plus for those visitors on an outing with younger dinosaur fans. Scenic World has sourced these exhibitions from all over the world. I’m surprised (and delighted) to catch a glimpse of some lesser-known species I’ve not yet heard of. Rounding the corner, we meet Barbara the baby dinosaur – a delightful baby triceratops hand puppet. The enthusiasm of the rangers is contagious and I’m embarrassingly excited to pose for a photo with Barbara. Ringo the raptor is another highlight, bouncing cheekily and taking snaps with happy visitors. The raptor costume impresses with its sizeable and lifelike swinging tail. Listening to the sounds of birds in the trees, we continue along the misty trail until we reach the recently renewed cableway, which was reopened in September 2018 following a multimillion-dollar upgrade. I experience a mix of both awe and trepidation as we sail high above the valley, back to where we began at the Scenic World main hub but before we depart the cableway cabin I take a moment to appreciate the panoramic views of the valley. Having explored Scenic World with a grown-up dinosaur fan, I know a few smaller ones I’d like to return with before the event closes.